KITS ON. FLAGS OUT. SCARVES UP. 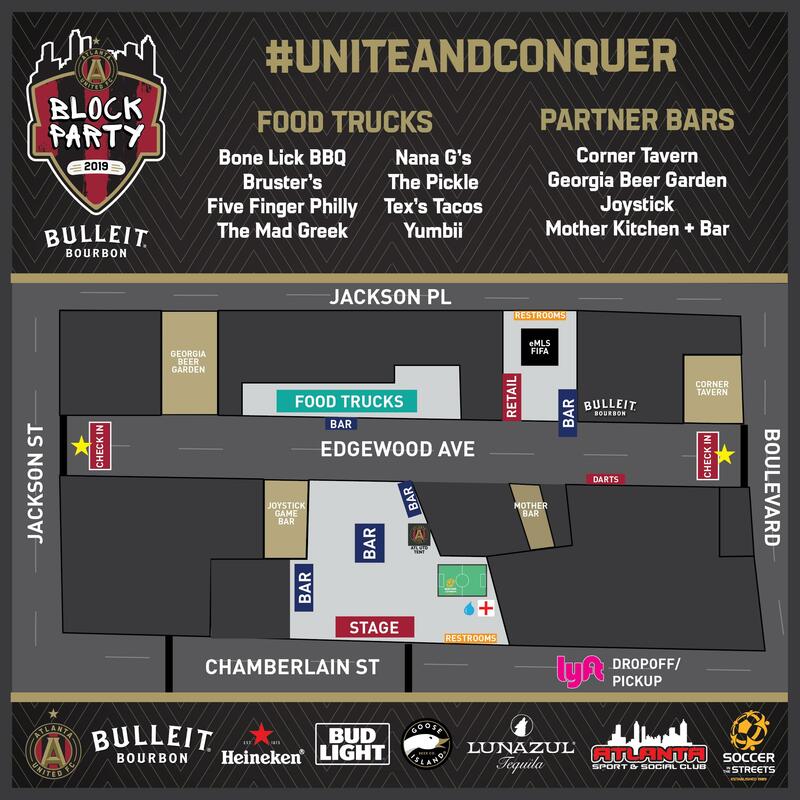 Join Atlanta United, Atlanta Sport and Social Club, and thousands of fans on Saturday, March 9th on Edgewood Avenue for the second annual Atlanta United Block Party - ATL's biggest open-streets celebration of all things #ATLUTD. We're closing down Edgewood Ave., and celebrating with giveaways, live entertainment and raffle prizes on the block as we prep for the first home match of the season! Plus - we're partnering with the local pubs to offer exclusive drink specials for Atlanta United fans during the event. Must be 21+ to enter the event. Ticket required. WAIVER AND RELEASE. I understand that participation in the programs and the events involves risks and dangers of serious bodily injury, including disability or death (RISKS), that these RISKS may be caused by the negligence, recklessness, action or inaction of myself or others, that there may be other risks and social and economic losses not known or foreseeable. I understand that there are all sorts of risks of illness, injury or death inherent in any program of physical exercise. Common risks include, but are not limited to, increased pulse and respiration rate, joint stress on weight bearing joints, fatigue, and possible blood clotting which may cause fainting, sore and/or pulled muscles, side cramps, charley horse, dehydration, broken bones, and heart failure. Participant further understands that risks can be intensified and become severe in participants with certain high level of risk factors identified as high blood pressure, obesity, diabetes, high fat levels, alcohol use, cigarette use, history of heart disease, and history of joint disease, back or knee disorders. 6. I will inspect and examine all conditions with which I am involved and relating to the programs and events I participate in and, if I observe any condition which I consider to be unacceptably hazardous or dangerous, I will notify the Atlanta Sport and Social Club and will refuse and refrain from taking part until the condition has been corrected to my satisfaction. Participant does hereby release and forever discharge and hold harmless Atlanta Sport and Social Club from any and all liability, claims and demands of whatever kind or nature, either in law or in equity, which arise or may hereafter arise from Participants participation in the sport programs offered or sponsored by Atlanta Sport and Social Club. Participant understands and acknowledges that this Release discharges Atlanta Sport and Social Club from any liability or claim that the Participant may have against Atlanta Sport and Social Club with respect to any injury, illness, or death that may result from Participant's participation in the program, whether caused in whole or in part by Participant's negligence or the negligence of Atlanta Sport and Social Club or its officers, directors, employees, or agents or otherwise. Participant also understands that Atlanta Sport and Social Club does not assume any responsibility for or obligation to provide financial assistance or other assistance, including but not limited to health or disability insurance, in the event of injury or illness. This Release in no way eliminates Atlanta Sport and Social Club's liability for its own gross negligence. MEDICAL TREATMENT. Participant understands that Atlanta Sport and Social Club has no responsibility to detect factors that may increase illness or injury for Participant and that Participant should consult a physician before beginning or participating in a program. Participant does hereby release and forever discharge Atlanta Sport and Social Club from any claim whatsoever that arises or may hereafter arise on account of any first aid, treatment or service rendered as a good Samaritan in connection with the Participant's participation in the Sport. INSURANCE. The Participant understands that Atlanta Sport and Social Club does not carry or maintain health or disability insurance coverage for any Participant. Each Participant is expected and encouraged to obtain his or her own health insurance coverage. PUBLICITY. Participant hereby irrevocably grants to Atlanta Sport and Social Club, the right and authority to film, videotape, photograph and/or record, in any manner or medium, the Participant, and to use such film, videotape, photography and/or recordings (Products) in perpetuity, any number of times, for any purpose and in any manner or medium now or hereafter known in connection with the display, distribution, promotion, marketing or sale of Products by any means and through any channels, including, without limitation, in or on any website, marketing, advertising, promotions and packaging relating to Atlanta Sport and Social Club. OTHER. Participant expressly agrees that this Release is intended to be as broad and inclusive as permitted by the laws of the State of Georgia, and that this Release shall be governed by and interpreted in accordance with the laws of the State of Georgia. Participant agrees that in the event that any portion of the Release is held to be invalid, the invalidity of such clause or provision shall not otherwise affect the remaining provisions of this Release which shall continue to be enforceable. IN WITNESS WHEREOF, Participant has read and voluntarily signed this Release, and further agrees that no oral representations, statements, or inducements apart from the foregoing written agreement have been made.